Special discounts: We are offering a discount of $250 off the Costa Rica and Iceland trips, $200 off the Alaska trip, and $75 off the cost of the Adrirondack trip! Join an eco-tour group or make a private trip to Iceland, Costa Rica, Maine, Alaska, Baja Sur, Trinidad & Tobago or Greenland! 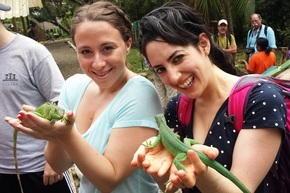 Greener Travel is a DC based adventure eco-travel company that offers individually tailored and group trips to Costa Rica as well as Jewish group adventures to multiple exotic destinations. We attract travelers who want to have an authentic, relaxing vacation - yet be off the beaten path at the same time. Subsrcibe to our mailing list for info about future trips and special offers!